Q. How do you become involved? A. What does it do? 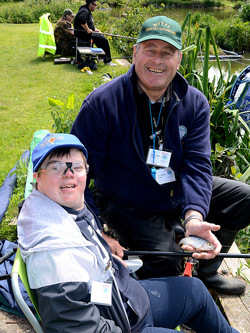 “The Masonic Fishing Charity’s aim is to bring an interactive fishing and countryside experience to people with special needs”. 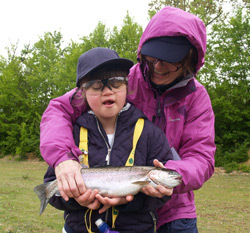 It achieves this by running fishing events, both coarse and fly and inviting participants with special needs to come and join in. This includes anyone over 11 with mental or physical disabilities, the disadvantaged or those who have suffered trauma. We hope to ‘Catch The Smile’ along the way. Lunch is provided for all participants, helpers and fishermen and usually consists of barbecued burgers, sausages and maybe some fresh trout at fly fishing events! Soft, non-fizzy drinks, sandwiches, fruit and snacks, tea and coffee. A vegetarian option is available on request. A ‘Certificate of Achievement’ for all participants. 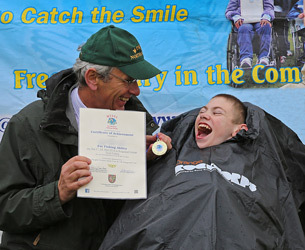 Medals for Biggest Fish, Best Caster, Best Retriever etc., are also often awarded. Health and safety instruction is given to all helpers and fishermen. Some game fish caught may be kept by the participants. Qualified first aider always on hand. All times are flexible and can be varied according to the participants needs. The Charity is a Masonic Initiative and is therefore funded by voluntary donations from Freemasons, Masonic Lodges and Provinces, Trust Funds or events organised by freemasons. There is absolutely no charge to any of the participants or their schools or centres taking part. Some money is also raised through raffles and the sale of merchandise in the form of polo shirts, hats, badges and other items, which are sold during the events and at other times. Everyone benefits from these days out. We have found that this is far more than a days fishing though! It enables mentally disabled people to gain in confidence, meet new challenges and achieve tangible results; it helps disadvantaged people and those from harsh backgrounds to renew their confidence in meeting people and interacting with adults from outside their spheres; it helps physically disabled people (including war heroes and stroke victims) to participate and experience something that may otherwise be unavailable to them. A lot of the schools and centres also use the day as a basis for a project or scheme, creating IT projects, models and wall displays. One school has gained a ‘special award’ for sporting achievement and their attendance at our events was an important part of this achievement. Whilst we are a Masonic Initiative the majority of our volunteers are not freemasons and there is no need to be one to join in. Being one of our team of volunteers will bring a lot of pleasure and fun for you and most will gain hugely from experiences received during these days. Many have not had the experience of witnessing first hand the problems that many of our participants face in their every day lives. Whilst it is not the policy of anyone to pry into the participants private lives it can be a real education when this short time is spent with them and much more awareness of the great amount of work that goes on in the specialist schools and centres that we are in contact with is also learnt. It also give a great opportunity to share our sport with those to whom it would be normally unavailable and to give something back to the community. 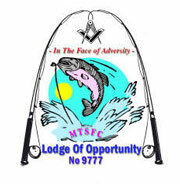 Many of our sponsoring lodges come and spend the day with us as well. Our charity provides a focus for those who care to support us and they can see a positive and tangible result for the money that they donate. They are also safe in the knowledge that the entire donated amount is spent on providing events for the participants. The charity has no paid employees, no buildings to support or other overheads other than normal printing, stationery, specialist and insurance requirements that any similar organisation needs to operate efficiently. A. How do you become involved? In 2004 a Lodge was formed by some of the Charity volunteers and you can see more information on the ‘LOO 9777’ tab on this website.